Model 195A-A Power Tilt Below-Hook Kontrol-Karrier with air power tilt. Models with electric power tilt are also available. 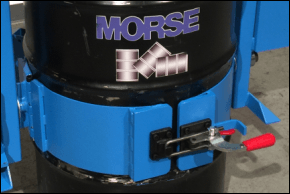 The drum holder of Morse 195G Series have a 3-Piece Drum Holder. 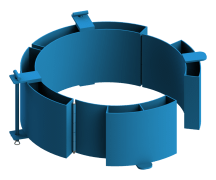 The metal band goes all the way round the drum, with 2 hinges on the sides, and a toggle clamp to secure the drum. 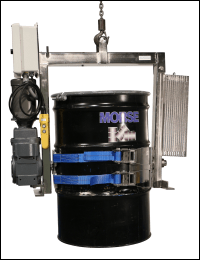 Morse engineers have designed these below-hook lifting devices with motor driven drum tilt for below hook applications. 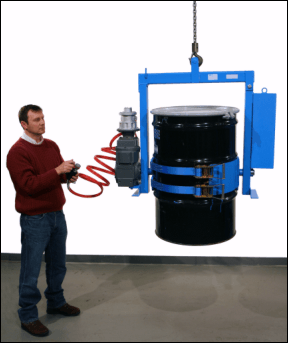 More than just a 55-gallon drum dumper (210 liter drum dumper), you have full 360 degree control of the powered drum rotation to dispense with this industrial lifting equipment. Model 195A-1-115 shown has Power Tilt Kontrol-Karrier with AC power tilt control has a two-button control pendant. Designed for 22.5" (57 cm) diameter 55-gallon steel drum (210 liter steel drum). See options below for other drum types and sizes. 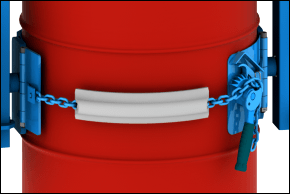 Option 6218i-P Replaces the 2 webs straps on 195A Series with a metal alloy cinch chain and ratchet to secure the drum. 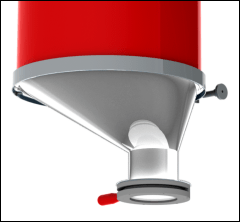 It includes a PVC cinch chain cover to help protect the drum sidewall. 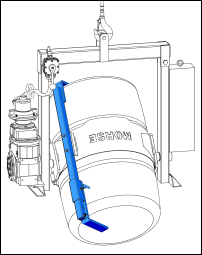 The Bracket Assembly is REQUIRED for a rimless 55-gallon (210 liter) plastic drum, and recommended for a fiber drum. Adjusts for a 31" to 37" (78.7 to 94 cm) tall drum. 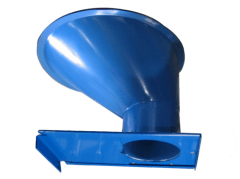 Stainless Steel Asymmetric Drum Cones. Shown with Iris Valve (Kit IV) to control product flow. 195A-1-115 Kontrol-Karrier, AC Power Tilt, 1 phase/115V 60Hz motor, 1500 Lb. (680 kg) capacity 480 Lb. (218 kg) L51" W27" H45"
195A-1-220-50 Kontrol-Karrier, AC Power Tilt, 1 phase/220V 50Hz motor, 1500 Lb. (680 kg) capacity 480 Lb. 195A-3-230 Kontrol-Karrier, AC Power Tilt, 3 phase/230V 60Hz motor, 1500 Lb. (680 kg) capacity 480 Lb. 195A-3-460 Kontrol-Karrier, AC Power Tilt, 3 phase/460V 60Hz motor, 1500 Lb. (680 kg) capacity 480 Lb. 195A-A Kontrol-Karrier, Air Motor * Power Tilt, 1500 Lb. (680 kg) capacity 470 Lb. (213 kg) L51" W27" H45"
4556-P Bracket Assembly for Rimless Plastic Drum, or to more securely handle Fiber Drum 18 Lb. 195G-1-115 Kontrol-Karrier with 3-Piece Drum Holder, AC Power Tilt,1 phase/115V 60Hz motor, 1500 Lb. (680 kg) capacity 540 Lb. (245 kg) L51" W27" H45"
195G-3-230 Kontrol-Karrier with 3-Piece Drum Holder, AC Power Tilt, 3 phase/230V 60Hz motor, 1500 Lb. (680 kg) capacity 540 Lb. 195G-3-460 Kontrol-Karrier with 3-Piece Drum Holder, AC Power Tilt, 3 phase/460V 60Hz motor, 1500 Lb. (680 kg) capacity 540 Lb. 195G-A Kontrol-Karrier with 3-Piece Drum Holder, Air Motor * Power Tilt, 1500 Lb. (680 kg) capacity 530 Lb. (240 kg) L51" W27" H45"
195GM-A Kontrol-Karrier, Air Motor * Power Tilt, spark resistant parts, 1500 Lb. (680 kg) capacity 530 Lb. 55/30-19GR Diameter Adaptor only for 19" (48.3 cm) diameter 30-gallon steel drum 50 Lb. 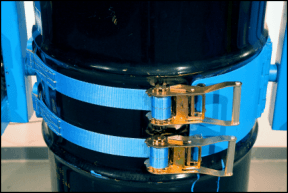 22.7 kg L31" x W26" x H11"
IMPORTANT - It is critical to use the correct holder and accessory to lift your drum type and dimensions. 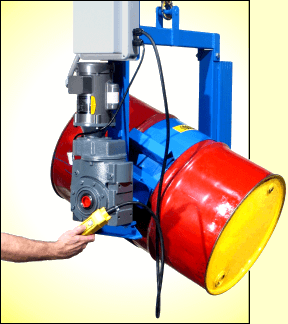 Powered Drum Handler for use below hook with your hoist or crane to lift, rotate and pour drum. Power Tilt Kontrol-Karriers.